Working on files in Elvis begins with first finding the files that you want to work on. This article describes the various ways in which files can be located in Elvis Cloud by using the Brand portal. Each of these methods can be used individually or in combination with one or all of the other methods. 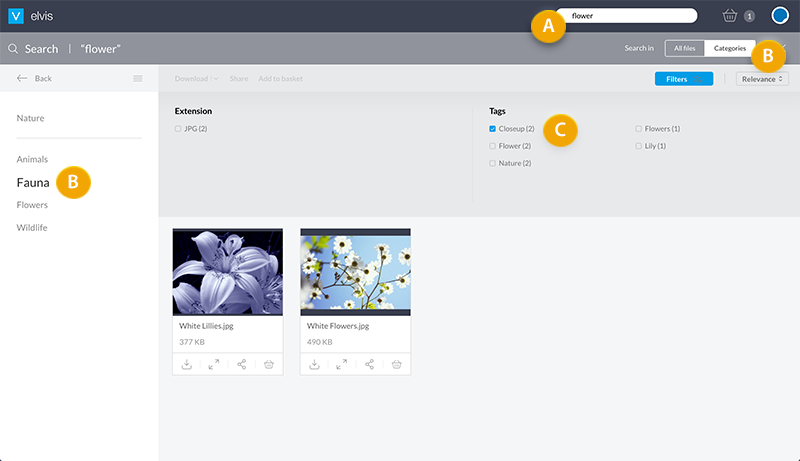 Example: Here, all 3 methods are used: a search term "flower" is entered in the Search box (A), Category "Fauna" is being searched (B) and the search results are filtered by tag "Closeup" (C). Enter a search term in the Search box to find any files with that phrase in their file name, description, tags, and so on. After entering the search term press Enter to perform the search. 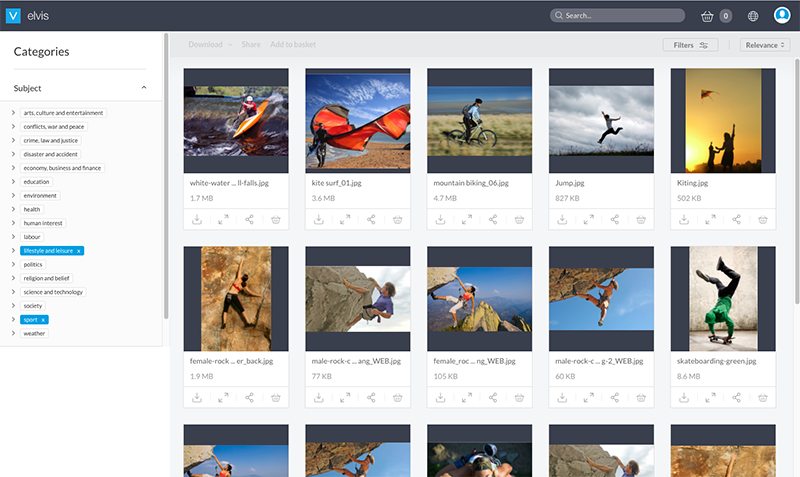 Leave the Search box empty to find all files within a location. Note: Browsing Categories is the default navigation method but can optionally be replaced by using taxonomies (see below). 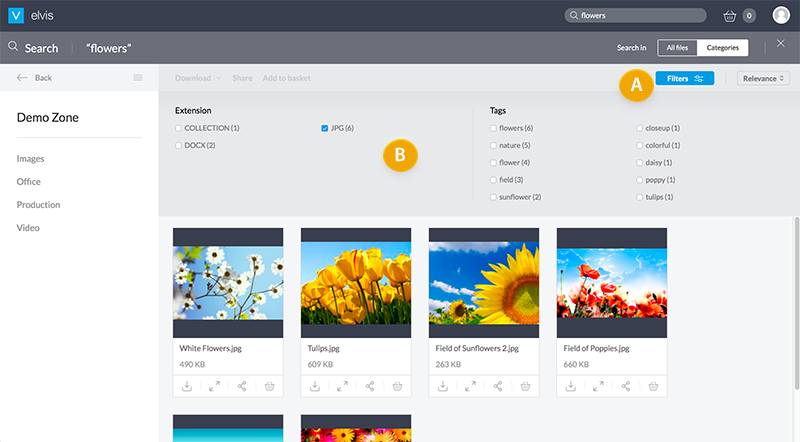 In the Brand portal, Categories represent the folders in Elvis. Instead of showing a folder structure, the Categories and any sub Categories are shown as a list. Figure: Using Categories to navigate the assets in the Brand portal. 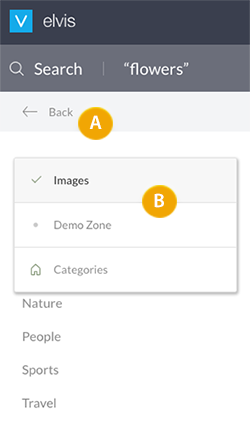 To navigate to previously accessed Categories, use the Back button in the Category panel or choose a Category from the main menu. Figure: When navigating sub-Categories, return to previously accessed Categories by using the Back button (A) or by choosing a Category from the menu (B). 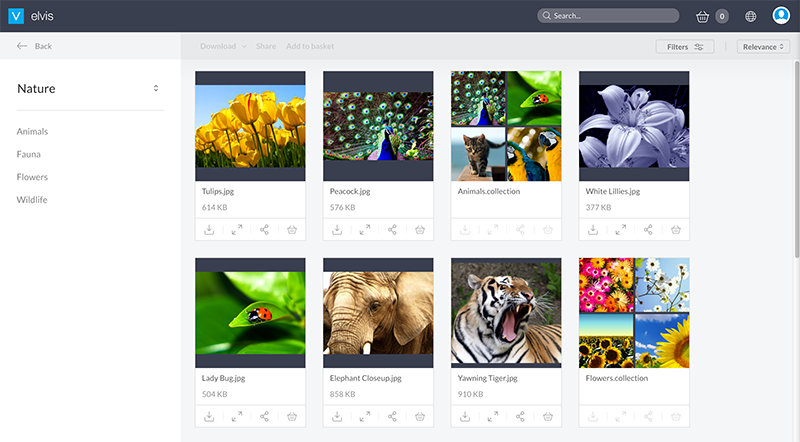 Instead of browsing files by using Categories, the Brand portal can also be set up to use taxonomies. Choose one or more taxonomies from the lists to make those assets appear that have these taxonomies assigned. Figure: Using taxonomies to find assets in the Brand portal. Use the Filter to further narrow down the search results. The Filter can be hidden and shown by clicking the Filters button. Figure: The Filter (B) is accessed by clicking the Filters button (A).